LONGWOOD, Fla., Dec. 13 /Christian Newswire/ -- Translating God's Word is no easy feat, but when author Ivorine Brown was given the assignment to share what she learned about God's salvation, she accepted the honor knowing she had something life changing to say. When she became a Christian 22 years ago, the first book given to her was about church doctrine. Her understanding of salvation was a process over a period of time and she embraced the opportunity to shorten that journey for someone else. 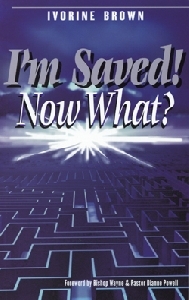 Her book, I'm Saved! Now What? ($10.99, paperback, 1-59781-892-5), provides new believers with guidance and direction to enhance their Christian walk. The book also serves as a refresher to the seasoned Christian and can be used as a ministry teaching tool. Says Brown, "I want people to know what salvation is all about so that they, too, can effectively compel others to come to Jesus. I have experienced the ups and downs of life and had to rely on my faith to get me through. God has given me the awesome assignment to put a pen to what He has taught me to share with others." This book is refreshing, laced with truth and reality with a touch of humor. It answers such questions as, what really happened to me, am I really a new person, do I have to be perfect, is there any sin that cannot be forgiven. Gifted with the ability to simplify often complex topics, Brown has a heart for God and a zeal that comes through in her writings. "I'm Saved! Now What? teaches individuals how to be like Jesus," she says, "Jesus is the greatest man who ever walked the earth, who now lives in the hearts of all who will receive Him." Ivorine Brown is an evangelist. Affectionately known as "Dr. Brown," she is a registered nurse by trade with a master's degree in nursing education. She resides in New York State. I'm Saved! Now What? is published by Xulon Press. Xulon Press is the world's largest Christian publisher, with more than 2,700 titles published to date. Retailers may order I'm Saved! Now What? through Ingram Book Company and/or Spring Arbor Book Distributors.